Mesothelioma is often misdiagnosed, which can delay treatment and lead to a worse prognosis. Mesothelioma is often misdiagnosed, largely due to nonspecific symptoms. A wrong diagnosis can occur at any stage of the diagnostic process. A misdiagnosis can ultimately delay treatment and impact overall survival. A mesothelioma specialist is the best person to ensure an accurate diagnosis. Mesothelioma misdiagnosis is a rather common occurrence. Since each case of the rare asbestos cancer is unique, it can be extremely challenging to recognize the signs of mesothelioma. As there are only about 2,500 new cases each year, most doctors do not have experience with the disease to recognize it and may mistake the cancer for even common illnesses, like the flu. Early diagnosis is crucial for providing patients with the most treatment options and a better life expectancy, making a second opinion with a mesothelioma specialist critical. There are a number of issues that can prolong a proper mesothelioma diagnosis. Patients and their doctors may face one or all of these problems, which can ultimately delay developing a treatment plan and negatively impact prognosis. Asbestos is the only confirmed cause of mesothelioma, though there are other risk factors that may contribute to the disease. For many, however, their history with asbestos and possible exposure may be unclear. Since the fibers are microscopic and invisible to the eye, the majority of people never even realize they were exposed to asbestos dust in the air, especially if the victim faced secondhand exposure. Without a clear history of exposure, it can be more challenging to suspect mesothelioma or other asbestos-related diseases, which may further delay a correct diagnosis. All types of malignant mesothelioma are accompanied with nonspecific symptoms, meaning there’s no defined, clear signs that can easily point to the cancer. For instance, malignant pleural mesothelioma is often accompanied by difficulty breathing, a persistent cough, chest pain and fever, so some patients may be initially diagnosed with a common cold or the flu. Recognizing symptoms also becomes complicated because of the long latency period. After exposure, symptoms can take 10 to upwards of 50 years to first appear. In the early stages, symptoms will also be very mild and may not even be noticeable for some time, further complicating diagnosis. Even patients who are properly diagnosed with mesothelioma can still face complications and inaccuracies with the diagnosis. Along with properly diagnosing the type of mesothelioma, identifying the accurate cell type can make a big difference in treatment options and a patient’s prognosis. Epithelioid mesothelioma, for example, is generally more responsive to treatment and less likely to metastasize quickly, while sarcomatoid mesothelioma is more aggressive and typically indicates less treatment options. A patient’s mesothelioma stage is also one of the biggest factors in determining prognosis and treatments available. Because of its rarity, pleural mesothelioma is the only type that has an official staging system, which can create many difficulties for properly identifying disease progression. Determining a patient’s stage of disease accurately is critical to developing the proper treatment plan. A patient with advanced stage mesothelioma may only have palliative treatment options available, while stage 2 patients would have curative treatment options, like chemotherapy and possibly surgery. 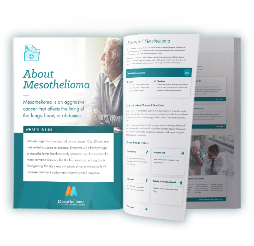 Since most primary care physicians will have very limited or no experience with mesothelioma, the best thing a patient can do is get a second opinion with a mesothelioma specialist. A second opinion is common practice for any diagnosis, but especially important for a rare disease like mesothelioma. An experienced doctor will best understand a patient’s individual case and how to treat it, and may even be part of the latest research and clinical trials with emerging treatments that could further improve life expectancy. The doctor will perform more diagnostic tests, including x-rays, CT scans and a biopsy or tissue sample, to ensure the mesothelioma diagnosis is accurate, as well as confirm cell type and stage. They will also be able to provide insight as to how the case can be expected to develop and provide a more accurate prognosis. Once a patient has the proper diagnosis, the medical team can develop a personalized treatment plan to improve quality of life or attempt to stop disease progression.